I’ve been sporadically using the Sigma 35mm f/1.4 DG since March. I find that I generally like the rendering of the lens, but the auto focus leaves a lot to be desired. I’ve found that at closer distances I need stick to the center AF point, and even then it doesn’t nail the focus as well as my nikon lenses. When it does it’s very nice. When it misses, well there’s yet another lost image. Those lost images add up to a lot of frustration. Luckily I’m not trying to make a living with this lens. My solution has been to stop down and shoot at f/5.6 to f/8 if I’m just using it as a walk around lens. Not optimal, and certainly not taking advantage of the fast f/1.4 aperture. I place an order for the Sigma USB Dock when it was announced. It finally arrived last week. Opening the dock was uneventful. It comes with the dock, a body cap installed on the dock, a USB cable, minimal instruction manual and a warranty card. The instructions do provide you with a link to download the application, but I missed it the first time looking though the sheet. I eventually found it with a search, but in here it is in case you are looking too: http://www.sigma-global.com/download. Once installed on my mac the software found the dock without issue. Mounting the dock to the lens was not as smooth. When I first tried I followed the alignment marks on the dock and the lens, but the dock didn’t want to turn. I looked it over a few more times and eventually concluded it must just be tight, so I applied a bit more pressure. It mounted, but it was far from smooth. Not a great first impression. After taking it on and off, which is something you will need to do often to calibrate the lens, it is now much smoother. The software immediately recognized the lens and offered to load the latest firmware onto it. This completed in a few minutes. Sigma doesn’t provide written documentation that I have found. However they do have a basic overview video at http://vimeo.com/64665246. The Sigma 35mm DG is a pretty simple lens and doesn’t have some of the modes the other lenses have such as focus limiters or image stabilization. So the options of what the Dock can set are limited. Pressing the Customize button you have only one choice, which is the Focus Setting button. This brings you into the focus setting screen where you can configure how the lens focuses at each of four different distance ranges. I haven’t found clear instructions on how best to determine the correct values. I wish the video had covered that a bit. But with a whole lot of trial and error I was able to get the values determined for my lens, which are shown in the image. I basically set the focus at the distance shown on the chart and positioned a high contrast target so it was in focus at the point. Then I pressed the AF-ON button and took a picture. If it wasn’t sharp I used LiveView to get a feel for which way the lens needed to be turned to achieve focus. I then tried an adjustment. I frequently overshot and need to redo each position several times. This took me about an hour. Remember each adjustment requires you to take the lens off the camera and mount it to the dock. 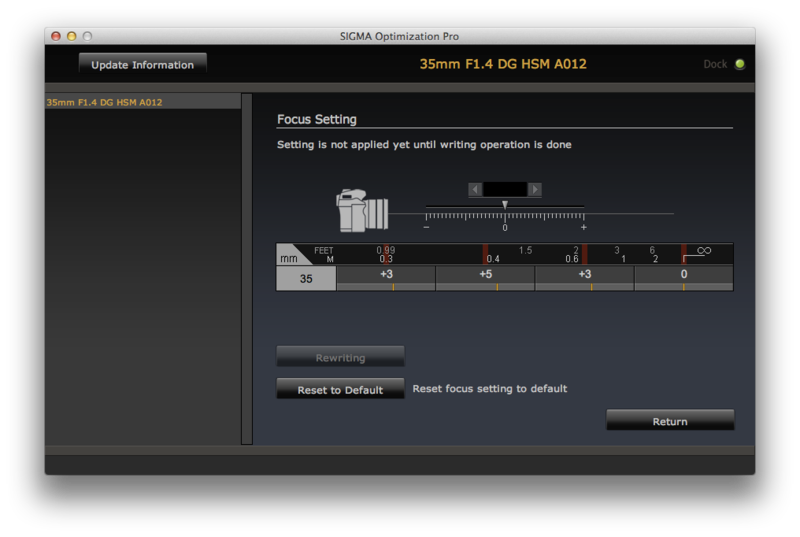 Then you navigate through the software to get back to the Focus Setting page. If I had a zoom lens I can see being very frustrated by having to adjust 16 different zones. Well it’s only been a few days, and I haven’t taken the system out for a real trial run. But I have made lots of tests around the house. The first thing I noticed is I can now use the side AutoFocus points and they seem as accurate as the center. I suspect this is a result of the firmware, but I didn’t think to do a before and after test. The lens is also much more accurate in the closer distances. I can shoot with confidence wide open, which is really nice since the image is so good wide open with this lens. I’ve had to resort to Live View in the past to get accurate focus in the past. I’ll be testing things out more over the rest of the summer. But it looks like the $59 fixed up my lens. I’m still a bit annoyed that it wasn’t perfect out of the box, but in the end I suspect that I’ve got a better match for my camera than if I had sent just the lens back to Sigma for a new firmware and calibration. I think this process will get old quickly with a zoom lens or two. If Sigma just put a USB port directly on the lens I can see this being much easier as you could avoid taking the lens off the camera each time.